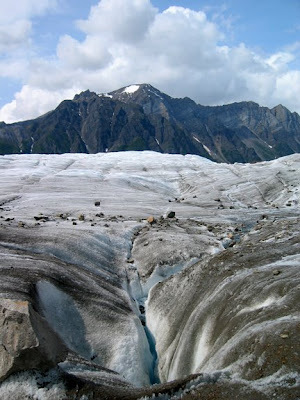 Heather's Paintings and Musings: Wrangell St-Elias National Park: Walking on glaciers and wrestling with moraines. 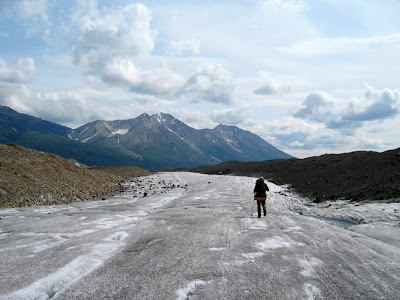 Wrangell St-Elias National Park: Walking on glaciers and wrestling with moraines. On our last morning in Wrangell-St. Elias National Park, Alaska, Michael and I knew we had to get organized early for it would be a solid day's hard trek ahead of us. However, we looked forward to it with much anticipation. It seemed as though the black flies had come out overnight and were swarming around us as we packed up camp. I looked upon the little site in the middle of nowhere where we had spent two nights. 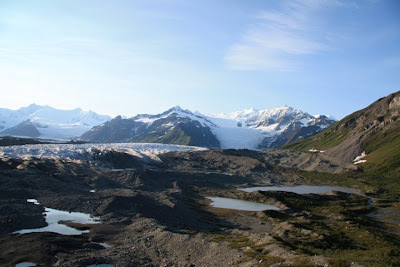 We were perched on the edge of the Kennicott Glacier in an area of rocky moraine mixed with scrub brush. This area was at the Donoho Lakes area of the park. Other than one or two people passing by we were utterly alone, and the silence and vastness had made their mark on my mind and spirit. of Donoho Peak and the area we camped in. This journey into the backcountry had left me blistered, bruised, inspired, elated, overwhelmed, humbled...all ingredients that by design and circumstance transform you, literally. My experience in the Wrangells really helped me know what I was capable of...that a little danger does a body good, and I desperately wanted to bottle those feelings, to preserve them and not let them be diluted with time. Although my aim was not to do paintings from my experiences on this trip, you can add inspiration to your internal creative cache using memories and sensations culled from intense experiences such as these to feed your work at a later time. I was simply enjoying the moment, every moment, as much as possible, and I knew that to take out a sketchpad would have prevented me from soaking up as much as I could. Instead I shot photographs, many, many photographs, trying to preserve it all; the smells, the vistas, the aches and pains, the entire, mindblowing uniqueness then and there. right hand side of this shot? That is our tent. I'm not kidding. Here is a slightly blurry, but closer shot of the yellow tent. This illustrates the sheer magnitude of the landscape. 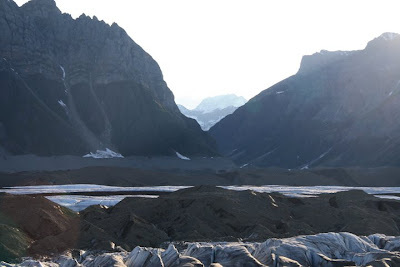 Below are some shots from our departure across the moraine, the seemingly endless sea of moraine that stretched ahead and arched down and away from us like a veil of rocks. Miles and miles of rock-covered ice that framed the glacier proper, the wonderful white ice that we climbed towards and on to. 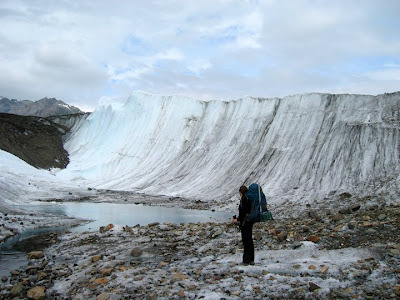 We hiked for six hours on our crampons, across ice and moraine. It was epic in the truest sense of the word. with moraine and mountains behind it. I took this shot the night previous. 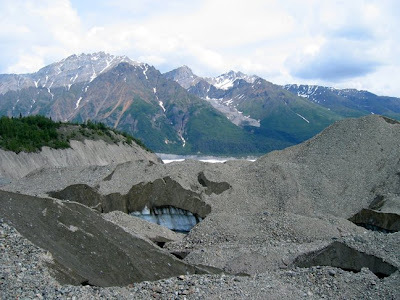 You can see the white ice of the Kennicott Glacier that we climbed towards. that were blue beyond compare. Surreal. 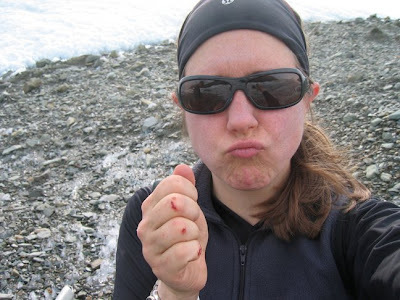 So apparently there are special boots that you wear that are designed for more rigorous walking with crampons on glaciers...we didn't have them and let me tell you, wearing crampons for hours and hours is a sure way to bring on blisters! 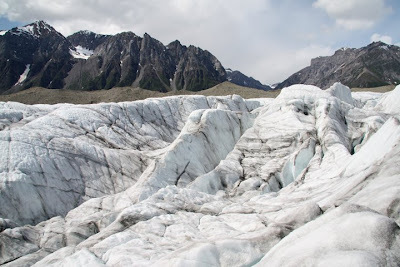 The exhilaration superceded the discomfort however as we clinked our way down the glacier as mile after mile of wilderness at once opened up and closed in all around us. 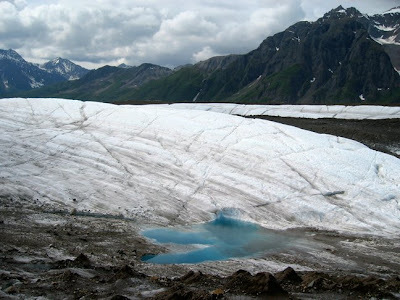 We stopped to refill our water bottles at some of the countless glacial streams..ice cold water right from the source. 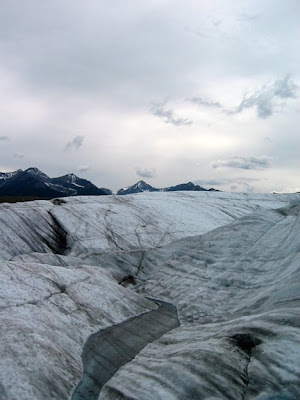 I can still taste that pure, icy goodness that propelled us and fueled us as we made our way carefully down the glacier. One of the tidal pools we stopped at. My mind could not process such a raw beauty that we encountered out there that day. Physically it was unpredictable, unplanned, mapped but not by us, intoxicatingly alien and held lots of questions: which route? to rest or keep going? should we turn back? This is like life isn't it? Choosing paths and accepting the consequences, persevering, stumbling, picking ourselves up and looking back with an exhausted happiness at the trials we have surmounted. We continued down the narrowing glacier, occasionally skirting the edge of a cliff or making our way around some obstacle or another. The walking was lovely..."like a sidewalk" at times, as Michael said. And speaking of Michael, this entire journey would have been impossible without his supreme organization, knowledge of the land and his amazing enthusiasm to top it off. We had a great time traveling together. Never under-estimate the power of laughter, the importance of preparedness, and the supreme enjoyment that you get from experiencing these pieces of paradise with such a wonderful friend. 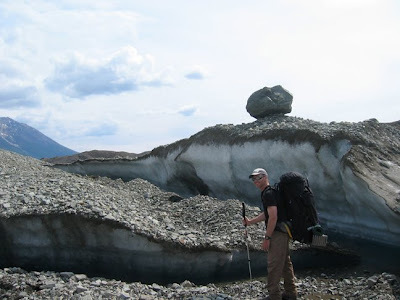 As I stated previously, Michael has summited Denali as well as countless other peaks in Alaska and loves a challenge. Ergo, a perfect traveling companion; someone who would push me, encourage me and keep me thinking positively when claustrophia and bushwhacking frustrations set in. Making our way down the narrowing glacier. 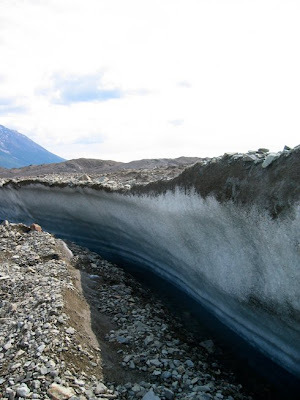 A crevasse typical of the terrain on the glacier. 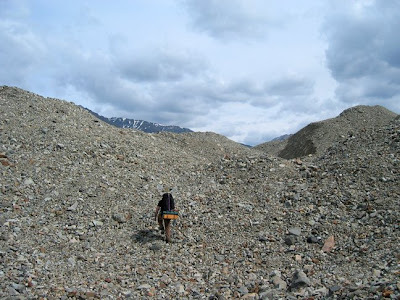 There was one particular leg of our journey that I had been quite nervous about...the moraines at the end of the trek that were situated between the Kennicott and Root Glaciers, not far from where we camped our first night. We ended up taking a slightly different route than the book suggested, crossing onto the moraine from the glacier a bit earlier. 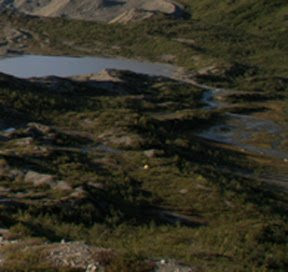 The distance across the moraine was probably only a mile and a half...and on paper that is not a large distance. However, the terrain we negotiated made the distance feel like 5 miles...it was amazing, stressful, challenging...I loved it! Michael continued with his pretty unblemished route-finding record as we made our way on to the moraines and had periodic discussions on which was the best path to take. This was the sea of icy/stoney craziness that we had to make our way through. You can see the glacier in the distance behind it. the detritus from such an immense, moving mass of ice. It felt truly as though we were on an alien planet at times. This shot shows just how massive some of the moraines were. We kept cracking jokes about this area of the trek looking like Tatooine , Luke Skywalker's home planet from Star Wars. Keep in mind we often slipped and slid on the ice underneath the rocks, even with the crampons on and clinging feebly at times. It was very...interactive and many scrapes and tussles with the land were had. I lost each battle but in the process found another layer of respect for this place. It takes no prisoners. It has no feelings. It simply exists in its perfect homeostasis that we had the opportunity to step briefly upon. towards Kennicott where we had stashed the bikes in some bushes off the trail. I display my badges of courage. I will be back to settle the score with the moraines! After we retrieved our bikes it was an easy bike ride down to Kennicott and then on to McCarthy. It was an uphill bike there so we essentially coasted, with lighter packs to boot. We took a side trip to McCarthy to check out the scene there. It was a quiet, quirky little place, with a quiet hum to it that the locals knew well of course. On we went after a short stay, headed back to the truck, and were off towards Valdez for one more night of camping before heading back to Anchorage. Even after seeing this photos weeks after the adventure happened, their poignancy still lingers. As I mentioned, I do not want these feelings to dissipate but cling to them as fiercely as I clung to the rocks which threatened to give way from their icy grip on the moraines. But I will not live in the past but cherish these feelings and energy gleaned, experience gained and passion for the outdoors ignited even more from this trip to Wrangell-St. Elias National Park. Thanks for posting all these fab photos. I used to live in Jasper Nat. Park for years, and this really stirs me up - I miss it!